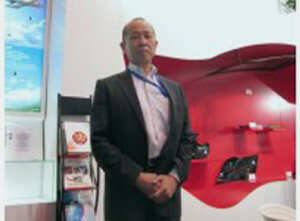 One of Teijin’s highlights at CHINAPLAS is its Panlite polycarbonate (PC) resin that can be used as a glass alternative for vehicle weight reduction. The material is chosen by Nissan for partition window used in its NV200 New York City Taxi. The plastic glazing is achieved by molding Panlite resin using the world’s first three-dimensional thick-wall injection-press technology developed by Teijin. The glazing is then hard-coated with Teijin’s three-dimensional double-sided flow-coating technology, also said to be the first of its kind. The result is a smooth, distortion-free surface, which has not been achievable with conventional thick-wall PC molding, according to Teijin. For automotive lightweight construction, Teijin is currently working on a PC/acrylonitrile butadiene styrene (ABS) resin for substituting glass windows, he revealed. In 2014, Teijin recorded sales of around 150 billion yen globally, with more than half of the sales came from China. Its 150,000 tons PC factory in Jiaxing city, China was operating at full capacity the whole year. Despite a promising business, Mr Kazuhiro observed that there is over supply in the market and therefore has no intention to expand its production in the imminent future. In fact, Teijin will shut down its Singapore PC site by the end of this year. We are emphasizing quality instead of quantity,” he stated.